Bookstores are under siege these days. Every month eBook sales increase. However, some bookstores are thriving. One of those bookstores is Open Books, a non-profit bookstore, in Chicago. Open Books, a 5,000 square foot bookstore sells more than 50,000 books – most of them half-off. 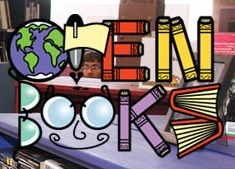 The bookstore’s proceeds benefit Open Books Buddies, a program that pairs volunteers with high-risk elementary-age students for one-on-one reading and comprehension practice. “I’m a detective, or at least I feel like one, as I walk through Chicago’s River North neighborhood in search of a nearly-extinct treasure: a thriving bookstore. Is there such a thing? I’m skeptical, especially after passing the sad shell of a former Borders on Michigan Avenue, but seven blocks later I find myself standing in front of Open Books, a wildly popular bookstore with a philanthropic mission.